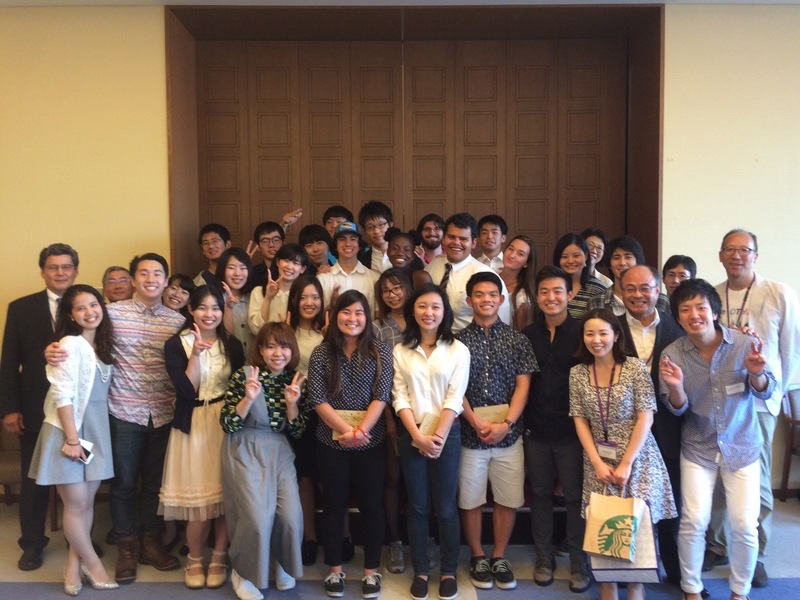 The third-to-last day of the GEA Japan Maymester was full of ups and downs, respectively. We started the day off by having breakfast to prepare for what would be an eye-opening visit to the Korean High School in Tokyo. I think I speak for everyone when I say that we were unsure of what to expect once we got there. Coming from the United States we knew very little about the lives of those who identify as North Korean or the country for that matter, other than what we are presented in our television screens. Needless to say, I was shocked and completely surprised at what we encountered at the school. When we walked up to the gates, the first thing I realized was the sheer size of the campus. A field half the size of the campus was the first thing that caught my attention. Growing up in LAUSD schools, I am used to large campuses, however this school surpassed any I ever attended in cleanliness and order. As we walked into the main building we took our shoes off and slipped on some walking shoes that were provided for us. The second thing I noticed was the lack of students walking around, however I soon realized this was because classes were currently being held and students, for the most part, were in their seats. After waiting for the school Principal in a nicely furnished meeting room for a few minutes he came in to give us a short history of the school. Although he only spoke Japanese, Rio was able to elaborate and pass on what he was saying to the rest of us. At the end of his conversation he asked if anyone had any questions. I knew, as did we all, that this would be a once in a lifetime opportunity to ask questions very few people in the world could. Surely enough, many of us asked about things ranging from the school’s stance on political agendas, intramural sports, problems not being accredited as a school some years before, and even questions regarding the school’s current lawsuit against the Japanese government for exempting them from the universal access to High School policy that had been enacted allowing other schools, including international ones, to offer classes to those not willing to pay for it. After answering our questions fully he took us on a tour of the classes. We visited at least four classes, English, Math, History, and a Japanese class, something I did not expect to find there. Despite the obvious pictures of North Korean leaders in the front of the classrooms these classes and more specifically, the students, were just as normal as any other their age. They would wave at us as we entered and ignore their teacher’s instructions because they were amazed and we were simply standing there. When Vincent, one of our classmates, was allowed to introduce himself he asked if any of them had any questions and like the teenagers they were they’d ask questions like, “Do you have a girlfriend/boyfriend?” and things of the sort while giggling among themselves. Before leaving, we were presented to about nine other students back in the meeting room where we first had our conversations with the principal. There we asked questions ranging from what they thought of the U.S. to what they wanted to be when they grew up. 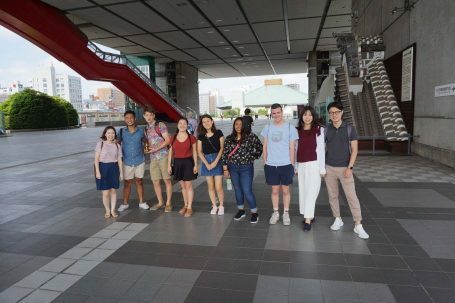 We even shared some laughs or two when students from either group would answer with things like, “My favorite hobby is sleeping.” After about three hours at the school we returned to our hotels to prepare for our farewell reception at Meiji University. I would have to admit that everything I encountered at this school surprised me, in a positive way. 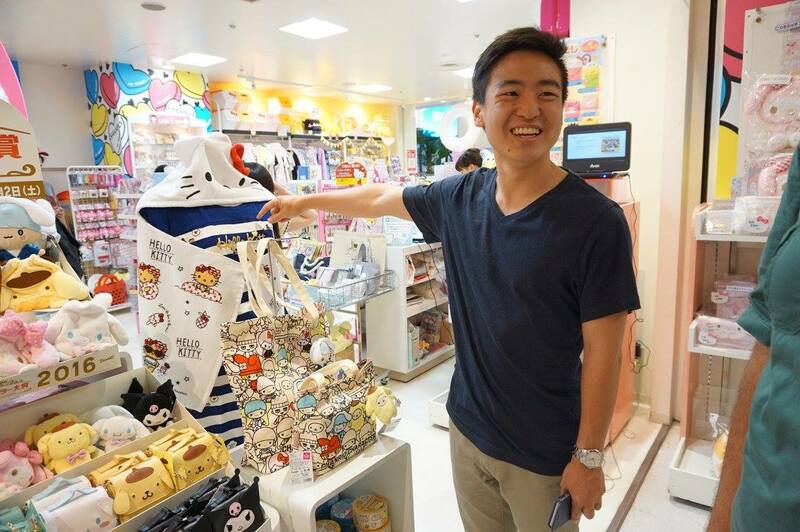 Instead of finding the die-hard devotees of the North Korean government I found a community of young people that were just interested in their ancestry and culture. Coming from a bi-cultural background myself I understood the significance of learning the history, language, and culture of your predecessors country while living in another. Although I cannot agree with the leaders of the North Korean government I sympathized with these students who simply wanted to keep their culture alive while doing their best to integrate into the mainstream society of the country they live in. I left this school with a much more positive outlook on the people who attend it and with a new hope for the future of peace between the countries of Korea and Japan. Today’s day started like the previous one. We woke up in our cozy rooms at Sakura Hotel and got breakfast before heading to the second lecture of our trip given by the very knowledgeable Professor Kato of Meiji University. We had previously learned about the depopulation issue in Japan but Kato Sensei went into depth about the different factors contributing to the fast decreasing replacement rate as well as delved into the adverse effects of a changing labor force participation rate. I found it extremely interesting to see the falling male work participation rate. From 2014, the 65.9 million labor force will decrease to about 58 million in 2030. He explained that this declining labor force will severely harm the economy, one that is already vulnerable to market pressures as we learned in Professor Takeda’s economy the day before. It was interesting to learn about the government’s efforts towards attempting to increase female participation in the labor force. Since Japan has an aging population, the incorporation of elder people (65 years and above) into the labor force will also help strengthen economic growth, which may help offset increasing social expenditure due to aging. The M-shaped curve of female labor force participation, that professor Katada had mentioned during our classes back at USC, is symbolic of the lack of balance between work and child-rearing that women in Japan find difficult to establish. The absence of social institutions to support women and more importantly, the minimal mature consciousness of society towards this difficulty are some key themes that we have learned about and that Professor Kato reiterated on during his informative lecture. 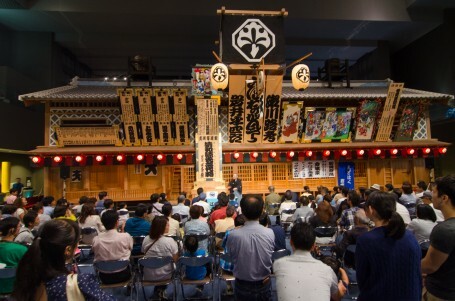 Some other topics he covered were the characteristics of the Japanese traditional employment system, non-regular workers engaged in the economy whose proportion increased significantly after the asset price bubble burst as well as foreign population and immigration issues. After the lecture, Yuni and I met with our Meiji supporters – Tokio and Honoka – to discuss our forthcoming presentation at Yamanaka Lake. While they didn’t know much about the anime part of our research, they showed a keen interest in helping us investigate the treatment of the LGBT community in contemporary Japan. We gave them a list of interview questions we had prepared and they offered to circulate them to provide us with data to support our research. 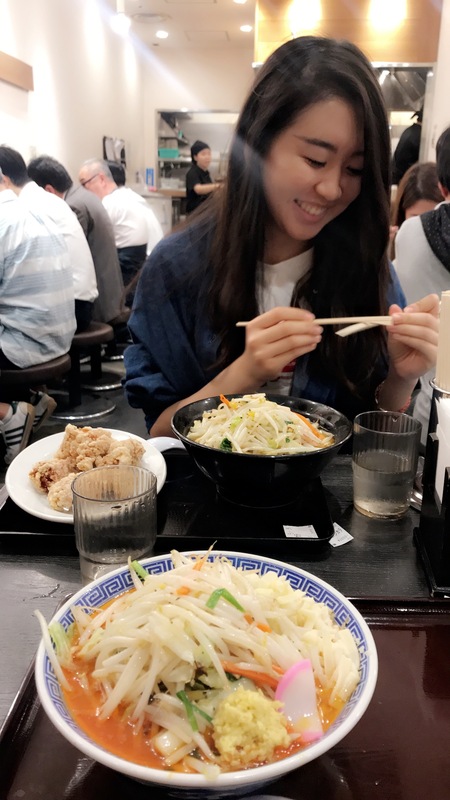 After wrapping up the meeting, Yuni and I took the Chuo line to Tokyo Station and headed to the famous Tokyo Ramen Street. The Tokyo Station itself is a work of art and the surrounding areas of Marunouchi were really fun to explore. It almost reminded me of midtown Manhattan, with its modern architecture and prevalent fashion and professionalism in every corner. We sat at a café and worked on our presentation for 3 hours followed by which we met Julie, Ipsa, Taylor, and Hannah for the famous delicacy – Omurice at Taimeiken. After that, we walked to Ginza and went to the Muji flagship store. Though I’m vegetarian and it has been hard on some days to find substantial meals, the food that I have encountered here in Tokyo has absolutely blown me away. Not to mention, my matcha obsession is being sufficed with every dessert shop Yuni and I manage to visit in between conducting field research at various different anime stores around Akihabara, Harajuku, and Ikebukuro. It’s an unsettling realization that we have already completed half of this program, but I’m sure I speak for all of us when I say that this is going to be one of the most memorable cultural exchanges any of us have taken part in. Skyscrapers, Trains, and People, oh my! 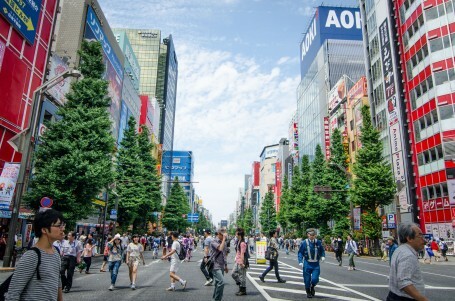 A metropolitan characterized by its bustling neon filled streets, complicated metro system, and abundance of people, Tokyo is a place that is rivaled by no other. 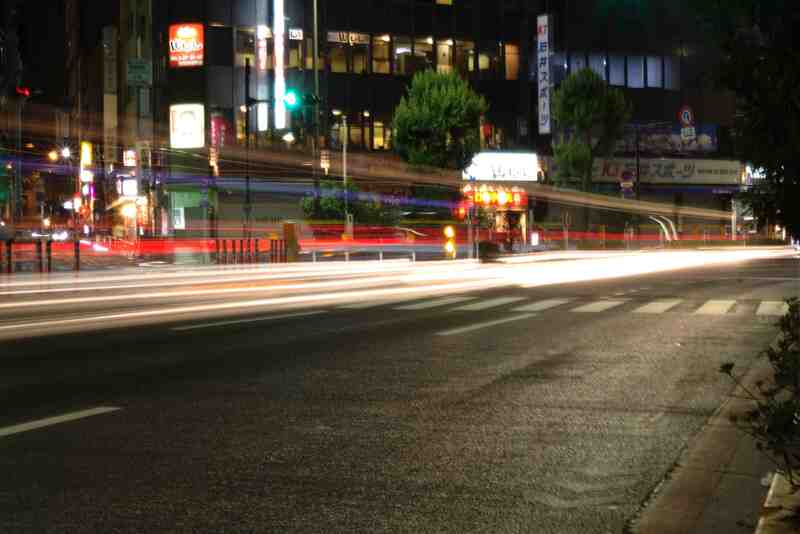 While Tokyo is quite different to other metropolitan areas it is similar as well. Waking up to sounds of ambulances and trying not to get hit by a taxi are all familiar occurrences from my home of Los Angeles. With that being said Tokyo is different from Los Angeles in that Tokyo is not a city. By definition, Tokyo is a Japanese prefecture and within that prefecture are different wards and divisions such as Akihabara and Shibuya. Starting off my day meant walking to a part of Tokyo known as Ochanomizu (御茶ノ水) to travel to our host institution, Meiji University. With all the familiarity of home one can find a McDonalds, with better orange juice than you’ll get back in the States, teenagers walking with their faces in their phones, and a bicyclist who is late to work. Growing up in a rather large city like Los Angeles, being in Tokyo seemed familiar and during my time here I have found myself feeling at home. With class at Meiji University over in the morning it was time to navigate Tokyo’s complicated metro system to get to Shinagawa (品川) for a meeting at Microsoft Japan. 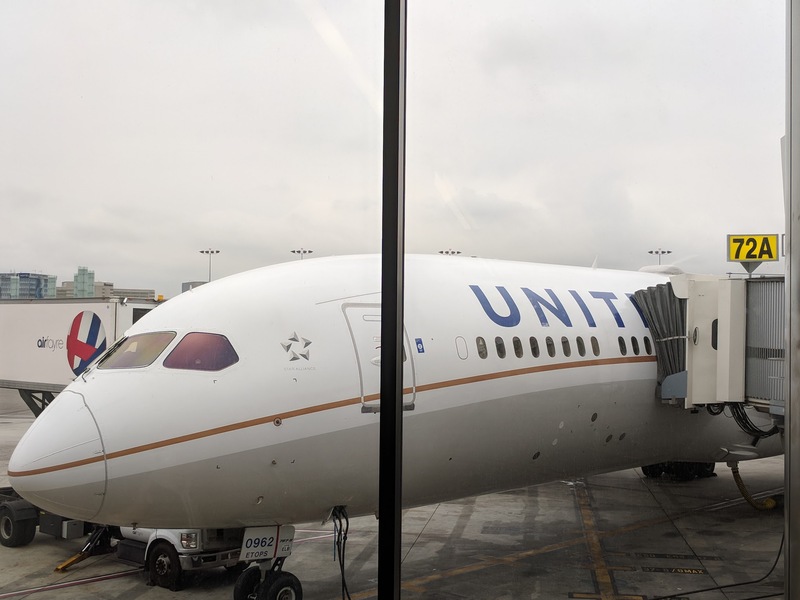 In terms of public transportation, Tokyo, and by extension Japan as a whole, has the entire Western Hemisphere beat in efficiency and reliability. When the schedule says a train is leaving at 9:33 that train is leaving at 9:33, with or without you. For someone who has never ridden on a large public transit system the task can be overwhelming but with English signs, a color coded line system, helpful station personnel, and an even more helpful transit app, navigating Tokyo public transit can be done. A transfer and a few stops later I found myself in the heart of Shinagawa’s business district, surrounded by business people during the lunch rush. Finishing my meeting at Microsoft I was now free to go about my day. I could return to Meiji to work on research or find somewhere a little more scenic. While on the platform at Shinagawa station I made a last second decision and decided to hope on the train to Shibuya. Navigating through the construction within Shibuya station I was greeted by the famed Shibuya crossing. With billboards on billboards and lights that could be seen from space it was indeed a sight to behold. Surrounded by tourists and their cameras I spotted something that everyone on USC’s campus is all too familiar with – Starbucks. With its location in Shibuya this particular Starbucks was filled with people but a decent amount of said people were not there for Seattle’s best, but instead wanted a glimpse of the Shibuya Crossing Rush from a higher vantage point. Not able to get a glimpse of the rush from a window myself I settled with doing paperwork for the next few hours at a nearby viewless table. With paperwork done and exhaustion settling in, it was time to head back to Meiji University, but what awaited me was something that I hope to only experience once. With the help of my Japan transit app I figured out the fastest way back to Meiji was via the Saikyo Line (埼京線) and to say this was a bad idea is an understatement. One of the more notable videos about Tokyo’s metro system consists of passengers being pushed into packed trains by station personnel hoping to keep everything on schedule. I can now say confidently first hand that I have experienced such an event and would not recommend it for the faint of heart. With no concept of personal space we were all packed into a steel tube on wheels until reaching our individual destinations. 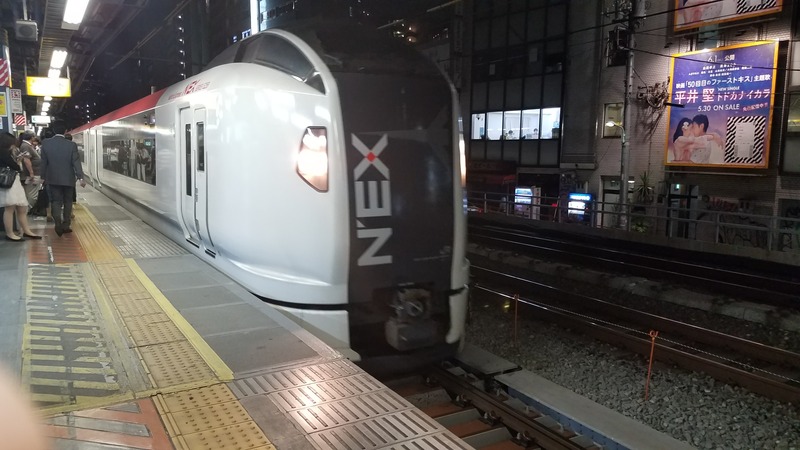 Assaulted by an assortment of smells, weird glares of trying to figure out who pushed who, and the occasional coughing riding the Saikyo Line during rush hour on a Tuesday is not a fun experience. Luckily for myself I only needed to ride said train for one stop and walking off of, or rather being pushed off of that train, was a relief I haven’t felt since finals season ended. At the end of the day one thing cannot be disputed, Tokyo is a large metropolis. It has a population of over 37.8 million people, a transit system that, while sometimes cramp, is rivaled by no other, and more ramen places that one hopes to try in a lifetime. With its large population and humid weather it is a marvel of human ingenuity and persistence to survive the day to day of work and social life. Tokyo you are a crowded and complicated city like no other, but I wouldn’t have it any other way. 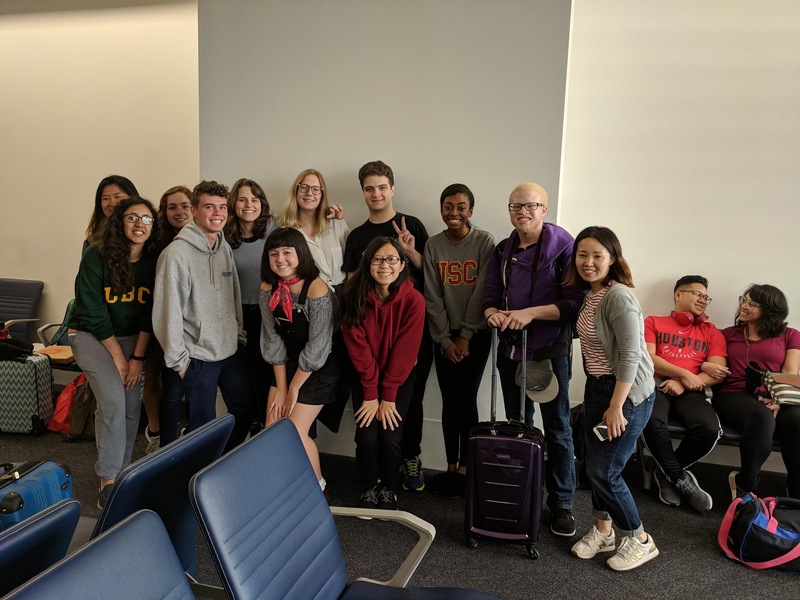 Today is the first day of our group visit and we all looked excited to officially begin our trip in Japan. At the metro station, we found a cream puff drink that looked super cool. Do they really put puff into a drink? Professor Kurashige didn’t hesitate a moment to get it, and realized it was just like cream soda, but without soda. Our first destination was Edo-Tokyo Museum, a huge building among its neighborhood, with a bizarre shape. It also had an escalator that was really similar to one at Pompidou. The museum was about the history of the city of Tokyo from 17th century to late 20th century. Since it was a history museum, I assumed it would be boring, but it was not. There were many interactive parts that allow you to actually experience the city life in ancient Tokyo, like how to put out a fire. There were actual models of the house they live in, the sushi stands, and so many more. 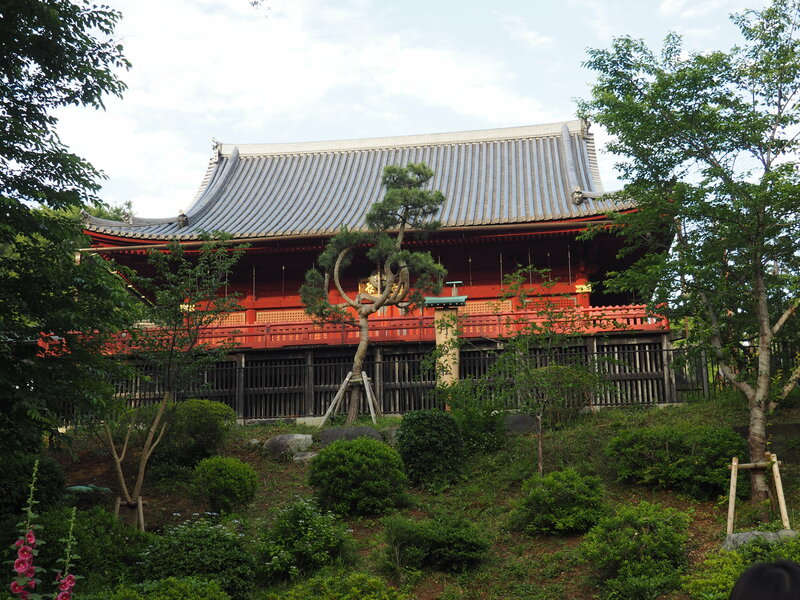 We learned that Tokyo was called Edo, and how the “shoguns” reigned Tokyo in prosperity for nearly 300 years. Because we had some extra time, we went to a garden on our way to lunch. 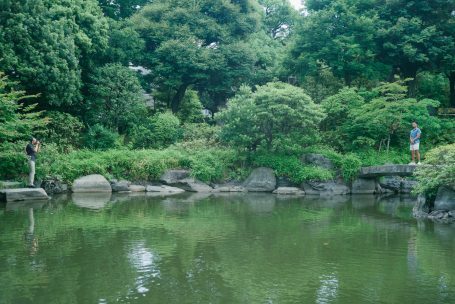 It was hard to imagine that there could be gardens in the heart of Tokyo, and it was not like a park, but a traditional Japanese garden with all the decorations. It felt magical to be in there, as we were in the heart of a crowded, busy city, yet there was a peaceful hideout for people to slow down their pace for a little. We were supposed to try the food for sumo wrestlers near the sumo arena, but there was a match going on, so it was a little disappointing. However, we saw several sumo wrestlers out in the street and Verdi even approached one of them for pictures. We went to a nearby Japanese restaurant for lunch later, which has tempura, a little hotpot, and sashimi. It was really good, so I guess it was hard to tell if the sumo game was bad for us. In the afternoon, we went to Akihabara. It was famous for its electronic goods, but now it was more about manga and maid cafes. Professor Kurashige invited us to go to a maid cafe, but most of us declined. According to Sam, the maid cafe was crazy, as the maids called him “master.” The rest of us spent the afternoon exploring the area. I went to a cat cafe. It was small, but there were nineteen cats. They were lovely, and we had a lot of fun playing with them. It is a heaven for cat lovers and I definitely recommend it. 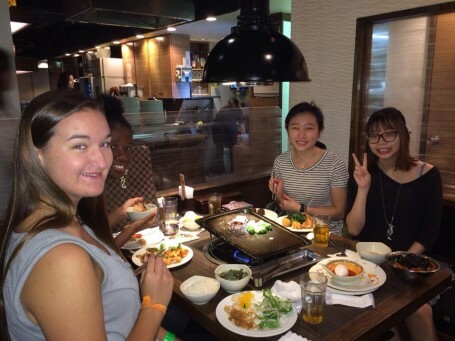 In the evening, we had dinner with some of the Meiji students. We also went to Karaoke with them, and had a lot of fun. 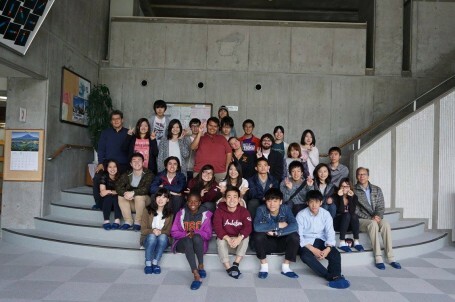 The students were really nice, and I hope the collaboration with them will also be good. As I watched the sun set through the narrow slats of the polished window, a somber sense of loss overcame me. I looked around at the faces, which in the past few weeks have become so familiar and precious to me, and smiled. This was our last day with the Meiji students. 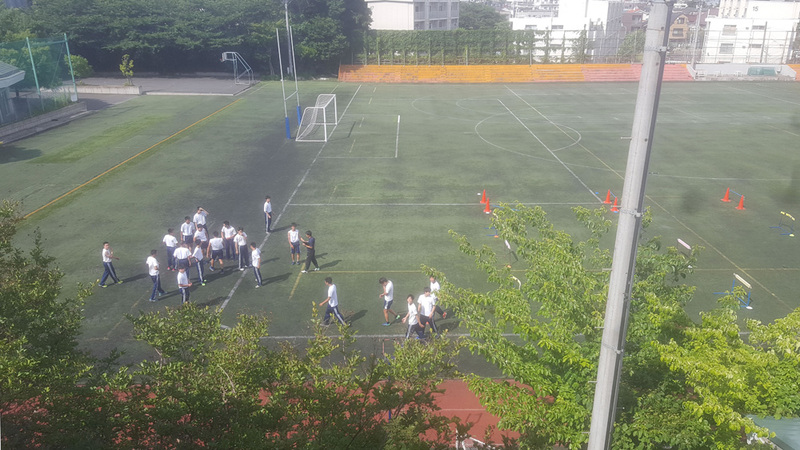 I looked again at my classmates, both Meiji and USC alike, and realized that not only was this our last day with all of the Meiji students, but that we would likely never see most of them again. I felt the corners of my mouth quiver slightly as the realization that our course was rapidly coming to a close truly began to sink in. A view of the sunset from the fourteenth floor in Meiji University. However, this is not a post about how much I will miss the students or the instructors, or even Japan. I woke up today to a warm stream of morning light filling our room at Sakura Hotel. Only eight a.m.. 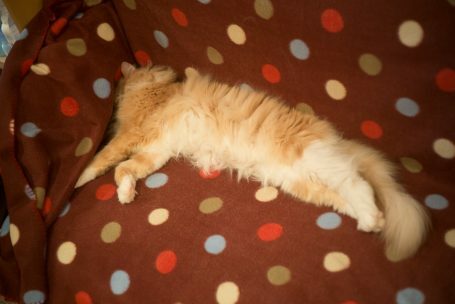 I rolled over into the softness of the comforter only to realize that I was unmistakably awake. I glanced across the room to see that my classmate and good friend Tiffany was already awake and getting ready for our day. With mild reluctance, I quickly got out of bed and changed. Today was the last day of our “food adventure” and we had until exactly three o’clock to take our last samples of the foods of Jimbocho. For Tiffany and I, this meant Moss burger and soba (buckwheat) noodles. Enjoying the morning calm, we wandered around the area floating from stationary store to stationary store, and convenience store to convenience store, snacking on rice balls and crackers as we moved along. Finally, after a satisfyingly delicious soba lunch, we returned to the hotel to prepare for our last official class meeting. 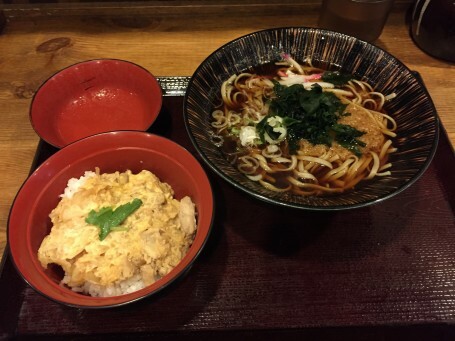 Lunch with Tiffany – hot soba noodles (buckwheat noodles) and a chicken and egg rice bowl. After changing into classroom appropriate clothing, we met with the rest of the class and began our last walk to Meiji University. I idly chatted with my classmates as we walked, slowly regretting the decision to wear pants as the sun bore down on our backs and hair, which were gradually becoming damp with the humidity and sweat. Upon reaching the university, we all sighed in relief from the reprieve of the sun. I watched as the numbers on the elevator lit one by one, showing our ascent to the fourteenth floor. It was our last class discussion. We spoke freely of our impressions of Japan and the U.S., and asked ourselves critically what it mean for a country to truly globalize. 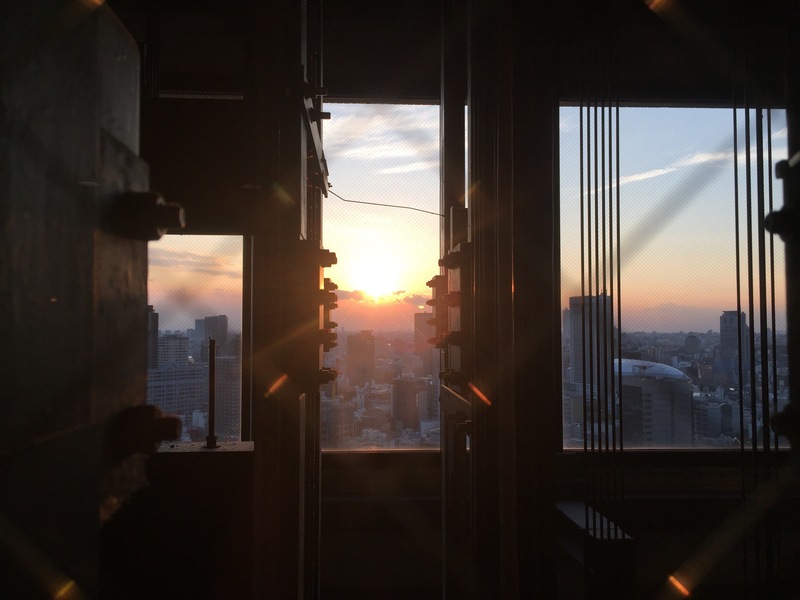 After the discussion, we once again entered the elevator and rode to the 23rd floor to meet our Meiji students for a farewell dinner. With our hearts light and eager to see each other again, we ate and listened to our class speakers as they gave their mini-speeches. Having the opportunity to work with and meet these students has been a blessing, an amazing experience, and a privilege by all accounts. We smiled and laughed as the slide show of the Lake Yamanaka retreat photos played on a projector. I looked again at my classmates, Meiji and USC, and tasted a bitter sweetness knowing that we would soon part, and this class and its experiences will have been over in all but less than a day. Our Meiji student speakers giving a last goodbye speech to the class. 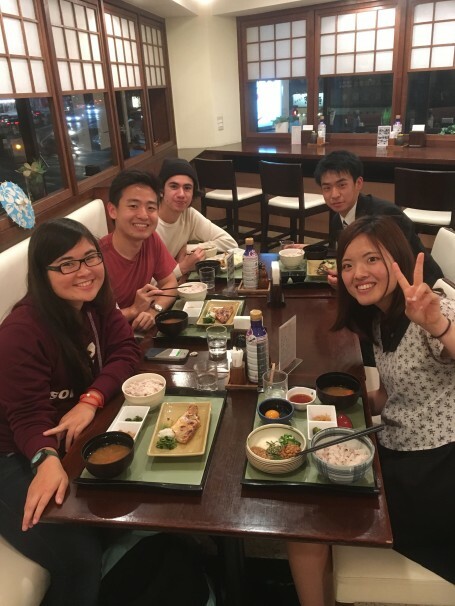 The USC-Meiji students and instructors at the last goodbye dinner/farewell party. These past few weeks have become more than I could ever have hoped for from any single class. I used to think that people were simply using a common phrase when they described something as, “having changed their life.” But this has sincerely been a life-changing experience, and one which I will certainly never forget. I came into this class expecting that I would enjoy the coursework, learn and experience many things, and gain a better understanding of the importance of globalization from different cultural perspectives. However, what I got out of the class was so much more than mere academic understanding of cultural and societal differences. 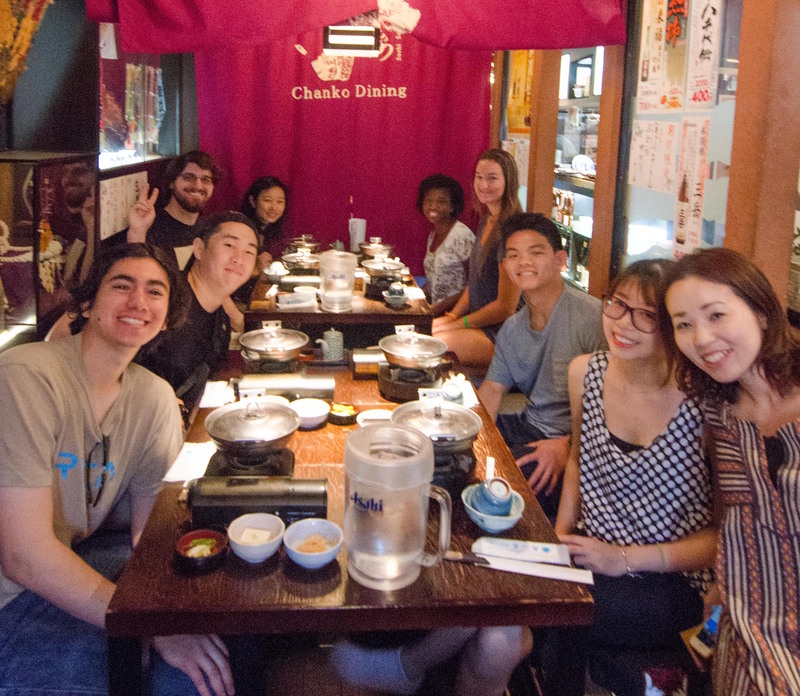 This course has given me not only a first hand experience of Japanese culture and Japanese people but it’s also given me lasting friendships with both USC and Meiji students. Academically, I now have a better comprehension of the roles of stereotypes in cultural identity and cross-cultural perceptions. I have come to realize that no single culture or identity is any bit superior or more advanced relative to another, rather, they are unique and both have strong sense of cultural identity and pride. Far be it from us to judge that which we cannot understand, we should endeavor to dispel inaccurate stereotypes and think critically about what our perceptions of others can indicate about ourselves. Goodbye Japan and Meiji. 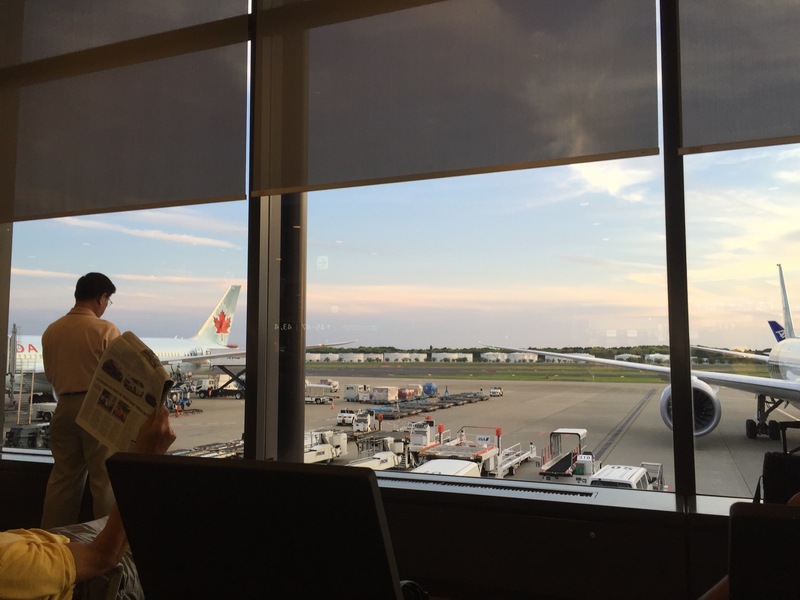 A view of the sunset from Narita Airport – waiting for our flight back to LA. While still recovering from the amazing dance party the previous night, both the USC and Meiji University students woke up to enjoy another amazing buffet-style breakfast that once again consisted of a mix of Western and Asian cuisine. 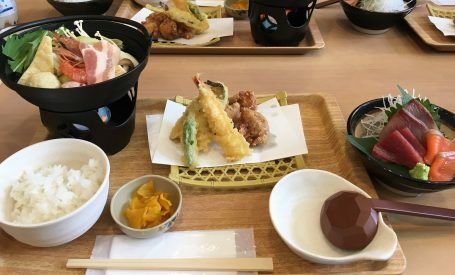 I know I personally ate many servings of food and was delightfully full, contrary to the healthy Japanese lifestyle advice that Jordan had presented where one should only eat until 80% full. Following breakfast, we met in the presentation room one last time with all of the students and teachers to review the many themes covered throughout the two days of presentations. 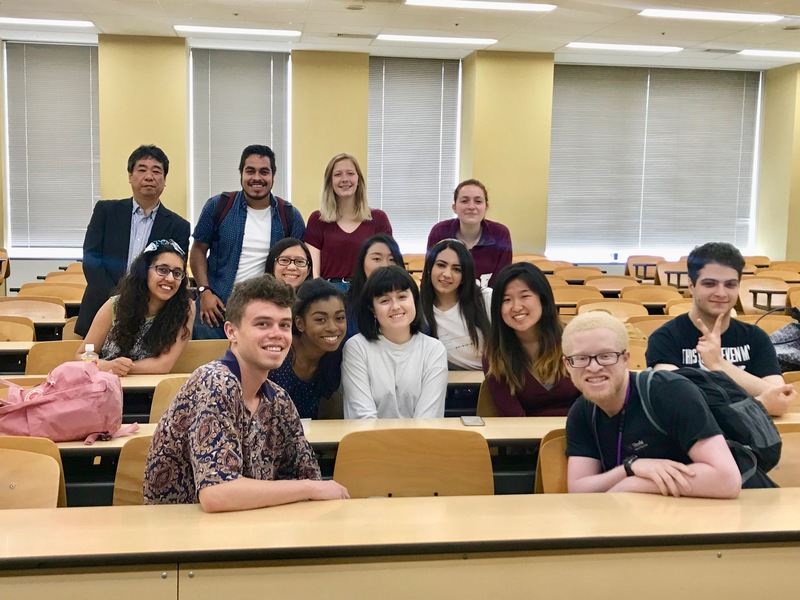 It was a great final meeting as I learned that just as the USC students had learned so much about Japan’s culture and society from the Meiji University students, they too learned a great amount from us. I truly feel that this is what cultural exchange should be, a mutually beneficial exchange that allows not only the sharing of knowledge and opinions, but the building of lifelong relationships. Soon after, we returned to our rooms and began the process of folding the traditional Japanese futons and blankets and cleaning up the rooms we slept in. While I personally had much difficulty sleeping on the futons in the traditional tatami (woven straw) floor rooms, I appreciated having the opportunity to experience such lodging. I especially loved the communal bath with the large, usually scalding hot, ofuro (traditional bath tub) that allowed me to relieve the pain and stress in my feet, legs, and joints accumulated from the legwork required of our daily adventures. However, our departure from the Lake Yamanaka Seminar House was not the end of our time with the Meiji students. Before heading back to Meiji University in Tokyo, we all rode together on a bus to Fujisan (Mt. Fuji)! While the rain poured and wind blew with a vengeance at our destination, a tourist visitor’s area midway up the mountain, all of the students were able to visit various gift shops and shrines. Some even bought various Mt. Fuji themes goods such as Mt. 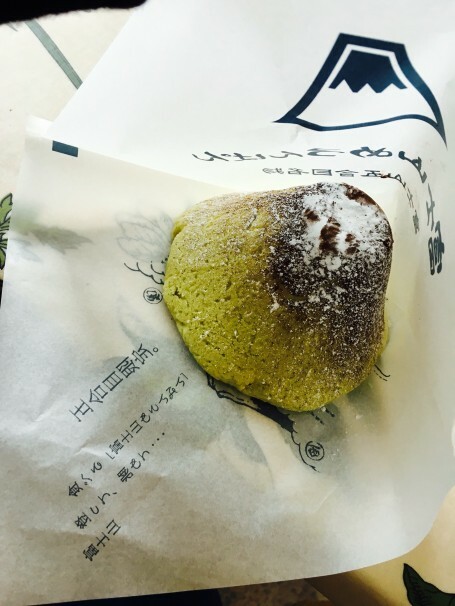 Fuji shaped melon bread! After we had spent about an hour at Mt. Fuji, we sadly had to make our way back to Meiji University. “Time flies when you’re having fun,” which was so true for this weekend which seemed to pass by in the blink of an eye. 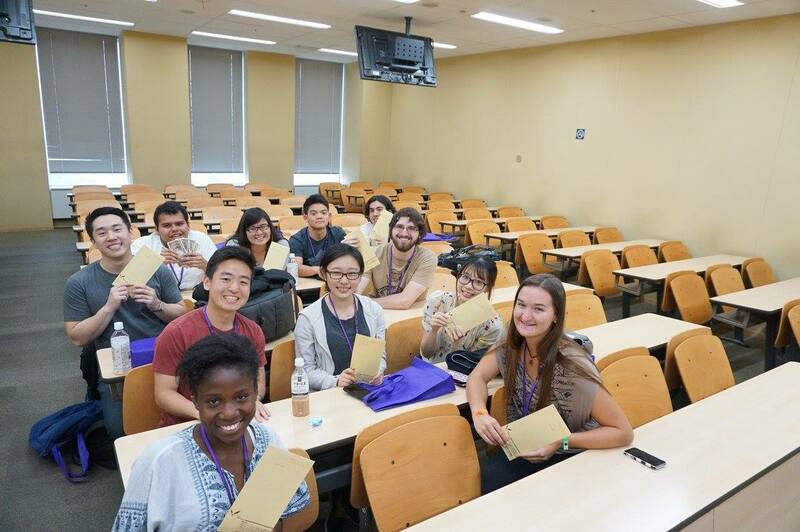 I loved having the opportunity to interact intimately with the Meiji University students and practice speaking Japanese and learn more about their lives, interests, and general perceptions of life. The great memories made with them over such a short period of time made our farewell in front of Meiji University especially bittersweet. However, knowing that we would get to meet them one last time before the program ends made me content, but anxious, in anticipation. The USC students quickly returned to our home base of Sakura Hotel Jimbocho, where we were able to do laundry, rest our tired bodies, and recharge before the next leg of our Japan adventure: Kyoto and Hiroshima. 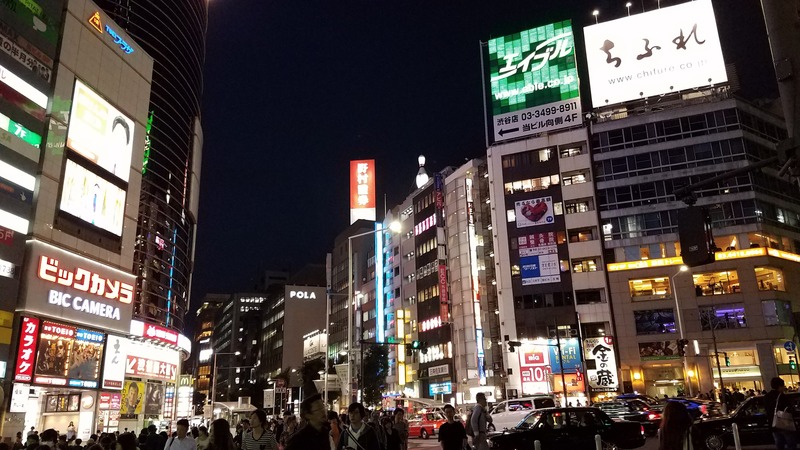 After the excitement of meeting our Meiji student research groups and receiving a scholarship from the Japanese government, our Global East Asia class went back to exploring Tokyo, this time visiting the city’s Koreatown-esque neighborhood. 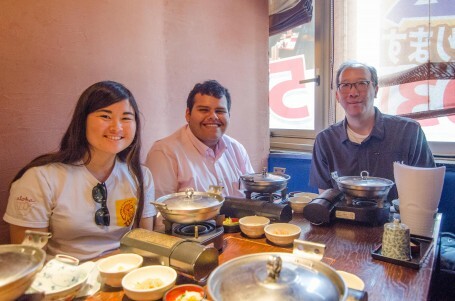 Our TA, Rio, led us to Pungumu, where we met up with Lon-Sensei and ate at an all-you-can-eat Korean BBQ restaurant. The restaurant was designed so that a customer could stand up and choose the meat and banchan (Korean side dishes), as they desired. With thirteen voracious eaters in our class, you can imagine that it got a little crowded at the buffet table. Shannon, Fridaouss, Laurie, and Tiffany enjoying a delicious lunch. Soon after we had our lunch, we were given some free time to explore the area. Some of us chose to walk north and ran into an arcade, where we found an electric slot machine and other games. After a few plays, we returned to Shin-Okubo to board the railway line to Jujo station. 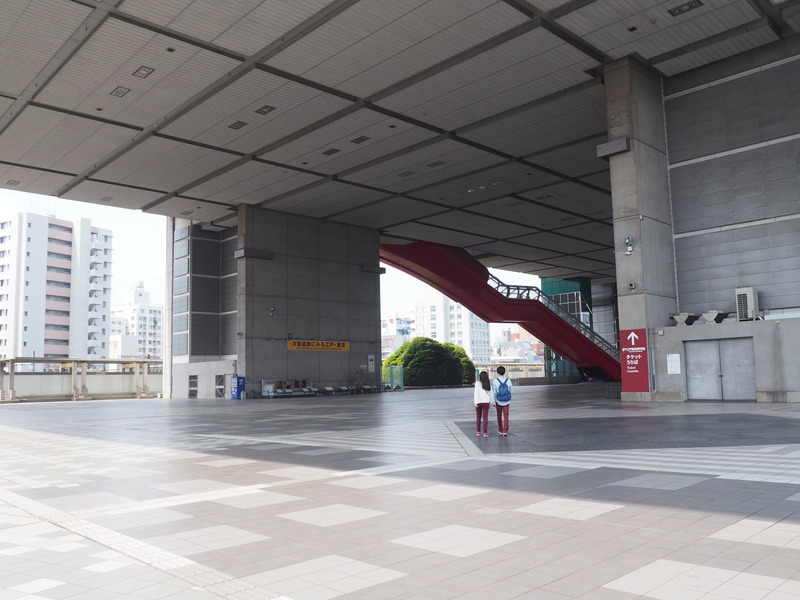 At Jujo station, we walked a bit to get to the Tokyo Korean School, where we got a tour of the facilities. The principal took us into several classrooms, where we saw the students studying English and Korean. 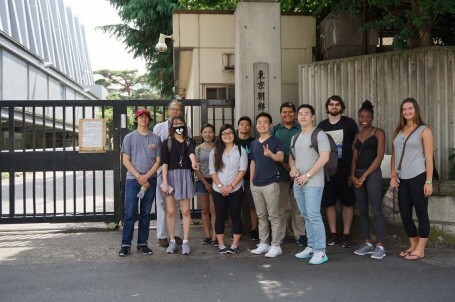 Before the tour, the principal informed us that the intent of the school was to instill Korean values and spirit in the hearts of students, even though they might be fourth-generation Zainichi Koreans, fully enveloped in the Japanese culture. These aspects were certainly reinforced by posters throughout the school’s hallways, declaring “우리 말” (woori mal), or “Our language” in Korean. After our tour we had the opportunity to talk to some of the students at the school. We were presented with four student leaders who we were able to converse with and ask questions. Our questions ranged from the school’s affiliation with the DPRK to their relationship with Japanese identity. After visiting the school, a few of us went to Ikebukuro’s Sunshine City, a mall that houses a Pokemon center and several other stores. 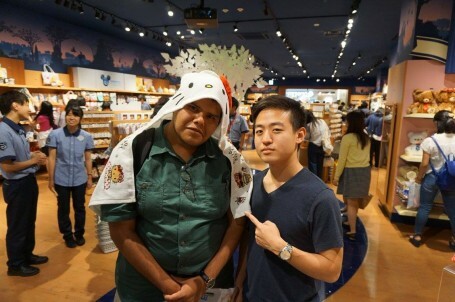 At the Sanrio store, I made a bet with Grant that I would wear a Hello Kitty towel if he purchased it. I’ll admit I didn’t actually expect Grant to purchase it, but before I knew it, Grant, Rio and Lon-sensei all pooled their money together to pay for the towel; being a man of my word, I wore it. Later, a few students went to Meiji University to meet with their student groups. I made plans to meet with my students another day; I’m even more excited to go to Lake Yamanaka as the day approaches! Dropping Japan’s hottest new album next year. After 3 long days filled with activity after activity, it was nice to finally get a chance to sleep in. We didn’t have to be downstairs until 10:45am, but jetlag got the best of me and I was up by 7:30am. With nothing to do for three hours, my roommates and I decided to brave the rain and go around to the convenience stores and try out different onigiri (rice balls filled with all kinds of goodies such as fish, plum, or fish eggs). By the end, we each had 3 or 4 and were absolutely stuffed! 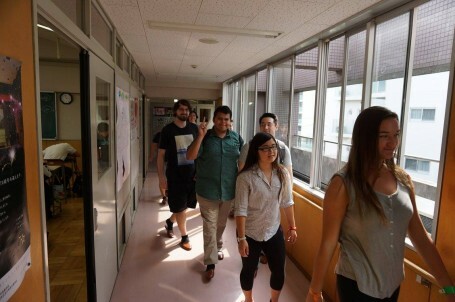 Once we got back the hotel, it was finally time to go meet the Meiji students! Armed with umbrellas, we all left Sakura House for the short walk to Meiji University at Liberty Tower. I was surprised that it looked much more like an office building than a school. The elevators also only went to the odd floors, which was a little strange at first, but turned out to be very efficient. We started off meeting with the Japan Student Services Organization and Professor Power, who gave us a brief overview of our schedule for the upcoming retreat at Lake Yamanaka. We then headed over to the Welcome Reception where the Meiji students were eagerly awaiting our arrival. At first I was pretty nervous about meeting them, but they were all so warm and inviting and I was instantly put at ease. They all spoke amazing English and were receptive of our broken Japanese. They even helped me to learn a few new phrases! 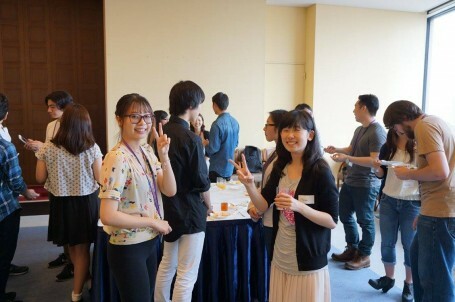 After short speeches by university professors and our own Professor Kurashige, it was finally time for lunch! Everyone rushed to the buffet filled with a variety of delicious food. Once everyone had eaten (many of us a little too much), Satomi gave us a tour of the Meiji building where we got to see the cafeteria, bookstore, and classrooms, oh and every type of vending machine you could imagine! 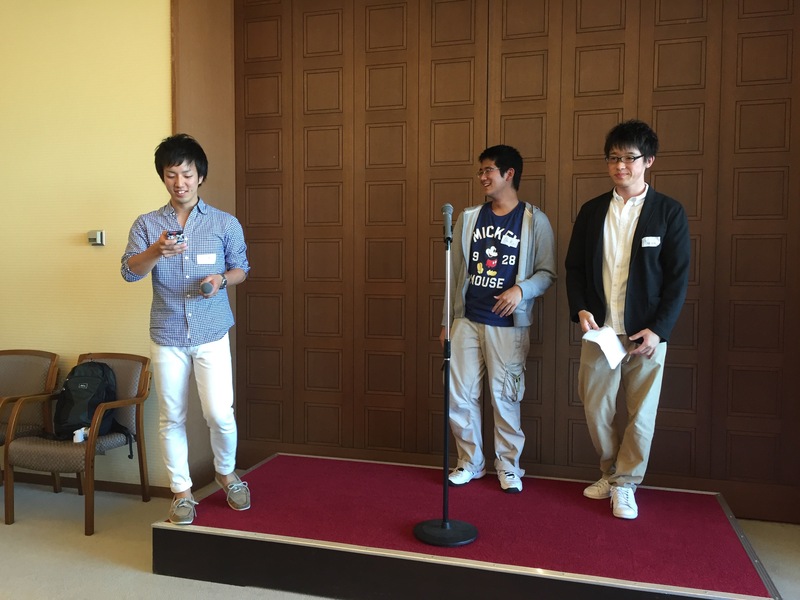 Finally, we said goodbye to the Meiji students full of excitement for the upcoming weeks and returned to another meeting with Japan Student Services Organization where we received the best news of the day: we would all be receiving 80,000 yen from the Japanese government!! After many cheers and a few tears we left with big smiles on our faces. Tiffany and Mami at the Welcome Luncheon! The class with our money from JASSO! We then faced the ultimate challenge: finding our way back to our hotel. With no WiFi or Google maps, it was definitely an adventure. After 35 minutes, multiple wrong turns, and asking 3 convenience store employees, we finally managed to make it back. 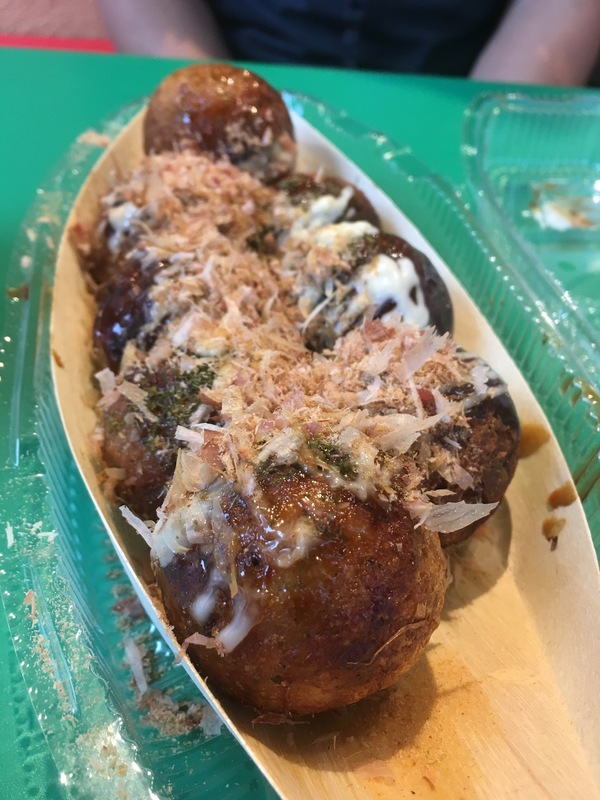 We decided to reward ourselves with takoyaki from across the hotel. After a short nap, it was back to Meiji to meet our group mates and start working on our individual research projects. My two partners, Makoto and Ayaka were both very enthusiastic and excited to talk about my research topic, Hawaiian culture in Japan. All the talking made us hungry, so we decided to get dinner with another group of students. We once again braved the cold and rain and ended up at a simple Japanese restaurant. However, instead of sitting down with a menu, we had to first order from a machine by the door, get a ticket, and then give that ticket to the waitress. I had never been to a restaurant like this and I thought it was super cool and efficient! All in all, it was a great day of meeting new people, exploring new places, and eating good food! I can’t wait to see what the rest of the trip has to offer! Grant, Daniel, Makoto, Shun, and I at dinner after working on our research projects! Sunday the 29th, and it is a sunny and bright day. We were definitely more rested than the day before, and I think most of us were starting to adjust well to the local time here in Tokyo. We began our day bound for the Edo-Tokyo museum, which is this futuristic looking and monolithic structure in the middle of Tokyo. Inside the museum was quite interesting and contained a wide collection of Tokyo’s history spanning from very ancient times all the way into World War II and the modern era. During our stay, a very enthusiastic tour guide led us around the museum and gave us a lot of background history as well. We learned that the reason the museum is called the Edo-Tokyo museum is because Tokyo was once called Edo back in Japan’s feudal era. We also learned a lot about the Edo (or Tokugawa) period and how the Shogun and his Daimyos (feudal lords) ruled Japan with relative stability for 300 years through a system of social and economical hierarchy. The tour was very interesting and offered an intricate overview of Tokyo’s history. Towards the end, we got also to see a little glimmer of traditional Japanese entertainment through the art of koma (spinning tops). I thought it was really nice to see that there are still people who try to preserve traditional Japanese culture, and I can definitely see how Tokyo, more than most modern cities, is a real cosmopolitan of both traditional and modern culture and values. After our visit to the museum, we made our way to a chankonabe restaurant for lunch, which was located very close to Ryōgoku Kokugikan (Tokyo’s famous sumo wrestling hall). Chankonabe is basically sumo wrestler food and is a stew made out of different types of meats and vegetables. I suppose you could call it kind of a concoction of foods, but it was done in a way that all of the flavors complemented each other, and it was quite delicious. 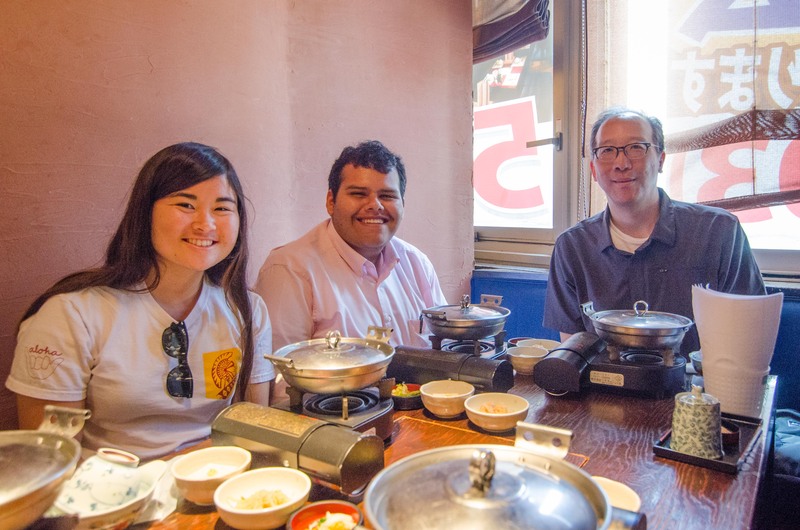 GEA Japan takes on chankonabe and comes out victorious! Our last destination together that day, and perhaps the strangest, was Akihabara, or the electric city. Akihabara is really famous for its electronic, manga, and anime scene, and it is really a bustling place. They even closed the streets that day (they close the streets every Sunday in fact) so that pedestrians could walk through the district without worrying about incoming traffic. While we were there, we visited a maid café, which was a very bizarre experience. All of the workers there were young girls dressed up as cute maids. The place itself reminded me of something straight out of Disneyland, and it was definitely a very unique environment. Most of us ordered drinks like coffee or milkshakes, and I was surprised to find out that the maids even drew a picture of whatever we wanted inside of our drinks with syrup. After we were done, a lot of us left to go explore Tokyo on our own. Akihabara has every electronic you could imagine and even the ones that you haven’t! I spent the rest of the day browsing through the streets of Ueno and the nearby park. Ueno itself kind of reminded me of Korea town in Los Angeles. There was a lot going on and the place just seemed so alive. The backstreets of Ueno was mostly filled with clothing shops and the like, and it was very easy to get immersed in all of the action. I tried not to stay long, however, because I did not want to spend all of my money on clothes. As the sun started to set, I decided to spend the last few hours browsing through Ueno park. My first impression of the park was that it was absolutely huge. It contained a pond filled with lotuses, temples, amusement park, and even a zoo complete with a panda. There was also a bonsai festival which showcased many different bonsai trees along with various foods from around Japan. I thought it was really cool to see how interactive everyone was and how people were not afraid to explain things, even if it meant speaking in English. By the time I was done exploring the festival, the sun was almost done setting, and I decided to call it a day. Although it was only our second full day here, I think we saw and experienced a ton, and we were definitely excited to meet the Meiji students the next day.